EU member states on Monday approved limiting use of the weedkiller glyphosate during an 18-month extension Brussels granted ahead of a report on whether the chemical can cause cancer. Experts from the member states set conditions like increasing scrutiny of pre-harvest use of glyphosate and minimising the chemical's use in areas like parks and playgrounds, said the European Commission, the EU executive. 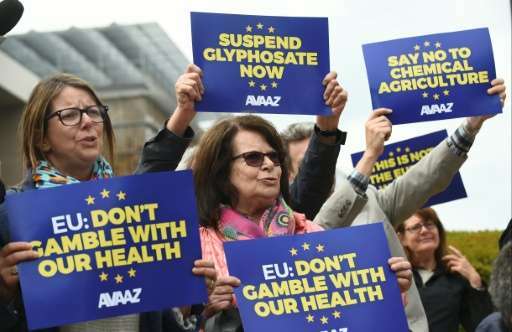 "The member states today voted in favour of a proposal by the Commission to restrict the conditions of use of glyphosate in the EU," Enrico Brivio, Commission spokesperson for Health and Food Safety, told a press conference. The commission made the proposal in parallel with its June 29 approval of glyphosate use for up to 18 months as the EU's 28 member states remained bitterly divided on the dangers of one of the world's most popular weedkillers first used in the Monsanto herbicide Roundup. EU national regulators had earlier delayed their decision on rolling over the approval of glyphosate for nine years after failing to find the necessary majority. Among major EU member states, France and Italy oppose re-approving glyphosate, while Germany has so far abstained from making a clear decision. Left with the indecision of the member states, the commission extended the existing approval until conclusions from scientific research by the European Chemicals Agency ECHA becomes available by December 31, 2017 at the latest. Opponents of glyphosate, led by Greenpeace, point to research from the World Health Organisation that concludes the chemical may be carcinogenic and are calling for the ingredient's outright ban. In May, a review carried out by experts from both the WHO and the Food and Agriculture Organization said "glyphosate is unlikely to pose a carcinogenic risk to humans from exposure through the diet."